Make yourself at home in one of the 6 air-conditioned rooms featuring kitchens with full-sized refrigerators/freezers and stovetops. LCD televisions and DVD players are provided for your entertainment, while complimentary wireless Internet access keeps you connected. Conveniences include microwaves and coffee/tea makers, and you can also request irons/ironing boards. Featured amenities include a 24-hour business center, complimentary newspapers in the lobby, and dry cleaning/laundry services. Planning an event in Barcelona? This hotel has 592 square feet (55 square meters) of space consisting of conference space and a meeting room. Self parking (subject to charges) is available onsite. A stay at Apartaments Sant Jordi Comtal 33 places you in the heart of Barcelona, steps from Palau de la Musica Catalana and Passeig de Gracia. This apartment is 0.2 mi (0.3 km) from Placa de Catalunya and 0.3 mi (0.4 km) from Barcelona Cathedral. With a stay at Hotel Regencia Colon, you'll be centrally located in Barcelona, steps from Barcelona Cathedral and 4 minutes by foot from Palau de la Musica Catalana. 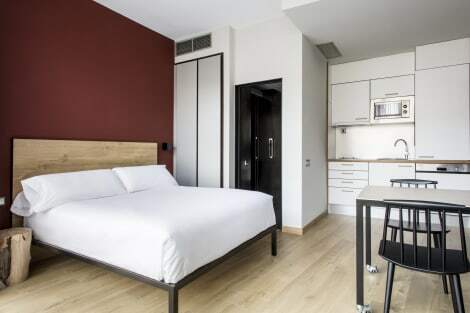 This hotel is 0.3 mi (0.5 km) from La Rambla and 0.3 mi (0.5 km) from Placa de Catalunya.